In this video, we're going to talk about field formatters and I want to begin by showing you where in the Drupal user interface you can adjust which field formatters to use and that will give you an anchor to figure out what field formatters are in their role in outputting content in Drupal. And then we'll take a step back in look conceptually at what field formatters are and how they work and how to extend Drupal by adding new field formatters. Okay. So what I've done is gone to Structure, Content types, and then Article. 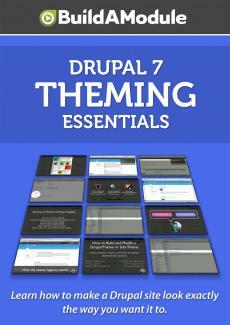 So this is the default article content type that comes with Drupal 7. Now, field formatters come into play right here in this format column as we're adjusting the output of the view mode of a particular node type. If we click on one of these dropdowns here, we'll see several options for how to output this content. So for example, this is the tags column and we can output the tags as links to the particular tags. So for example, we can click on the link to go to the page that contains all of the content that matches that particular tag or we can output them as plain text if we don't want them to be links at all. We can even hide it. If we look at the body field here, we have some different options available to us because this is a different type of field. So I'm going to go ahead and click the dropdown here. We have a couple of custom options here which have been added through a contributed module called custom formats which I'll talk about in a little bit. We have default which is the outputting of the entire contents of the field. So this would be, for example, what you'd use on a full node page. Plain text, which will strip out all of the HTML and trimmed and summary or trimmed which can be used for teaser output. So these are field formatters. When we're talking about field formatters, this is where you'd see them used. Field formatters can also be used when outputting content in a view using the views module, using the fields row type. So in a previous video, we talked about using a view mode in order to render an entire node in a particular way which can then be reused across multiple views. But sometimes we'll need the granular control over particular fields inside of a view. In which case, we can use field formatters in a way that allows us to create an output setting for a particular field and reuse that across multiple fields inside of views. So if we need to get granular, this is a way we can still make the changes to the output portable. So let's go ahead and take a look at that.